What is Open Canadian Canoeing? Canoeing is an activity given to us by the American Indians. Open Canadian Canoe's are a great way to explore rivers, lakes and waterways. 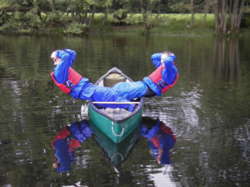 As an activity for groups or individuals canoeing is a really fun way to enjoy the outdoors. Using a specially designed sailing rig enables you to incorporate sailing into your canoe experience, just sit back and let the wind do the work. 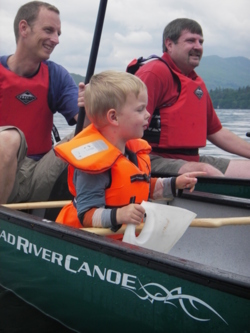 We met Dave bright and early on the Saturday morning for canoeing on Coniston water which is where the adventure began! Dave's experience ,knowledge an humour put us immediately at ease and set us up for a fantastic morning on the lake. We were also joined by little Quackers the 1 legged duck who we all loved ! In the afternoon we geared up to go gorge walking. This was an amazing experience for all ( even the nervous ones of the group!) Dave kept everyone working together and despite being freezing cold he managed to keep us all laughing ! All in all it was a great experience and a big thank you to Dave for making it such a memorable day ! We have many canoeing and kayaking venues in and around Lancashire and Cumbria in particularly around the South West Lake District areas, for example Coniston, Ambleside, Windermere, Hawkshead, Kendal, Bowness, Ullswater and Preston, to name just a few. use Mad River Explorer Canoes for their canoeing sessions and as transport during canoeing expeditions and wilderness canoe camps. To view some of our open canoeing pictures please click here Canoeing images. From time to time we have our 12 Mad River Explorers for sale. These canoes are great value for money and include "cheeses" a popular hard waring floatation / boat bouyancy device. Please feel free to call us for further details.